The love, ethics and humanist values shared by Cuba for over half a century of medical cooperation, were commemorated May 23 on the 55th anniversary of the launch of its international humanitarian missions, with over 400,000 health professionals serving in 164 nations worldwide. The story begins with Fidel Castro’s 1953 self defense History Will Absolve Me, in which he described how Cuban foreign policy would be characterized by solidarity; continuing after the triumph of the Revolution (1959), as a group of doctors and technicians are sent to treat victims of an earthquake in Chile in May 1960. Three years later the first institutional brigade featuring 28 doctors, four dentists, 15 nurses, eight technicians, and head of the contingent Dr. Gerald Simón Escalona, departed for Algeria. Of the 52 members on the brigade, 12 were women. The contingent was stationed in Algiers (1); Blida (13); Sidi Bel Abbès (22); Constantine (10); Setif (5); and Biskra (4), returning on June 26, 1964, after 13 months of intense work. The leader of the Cuban Revolution was in direct and personal contact with this first group, and almost all the subsequent contingents sent to serve in different places all over the world, including the doctors and technicians who offered assistance to national liberation movements in Africa and the people of those territories. These are the origins of Cuba’s internationalist medical collaboration, characterized by quality, diversity, and selflessness, and which has contributed to the island’s global prestige. 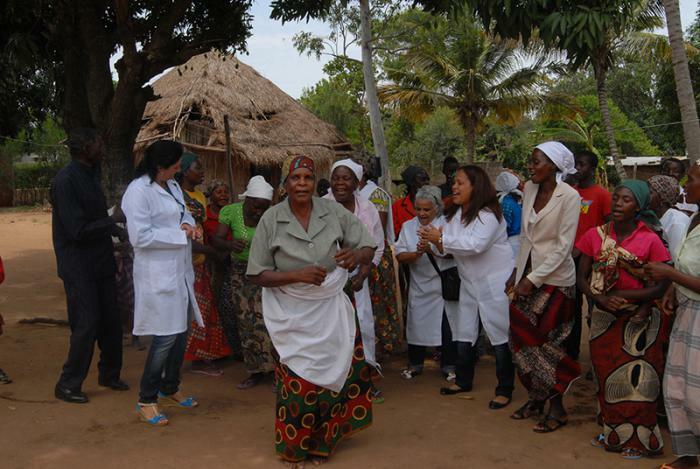 Its success can be seen in the experiences gained to date, legacy of the work undertaken, example and sacrifice of collaborators, improved health indicators, and its impact on the people treated, according to Dr. Regla Angulo Pardo, director of the Central Unit for Medical Cooperation (UCCM), speaking with Granma International. For Dr. Angulo, these 55th anniversary celebrations represented the perfect occasion to honor the anonymous efforts of Cuban healthcare professionals, tasked with facing calamities caused by natural disasters and exclusionary healthcare systems in developed countries. “This 55th anniversary is dedicated to healthcare’s greatest champion and creator of Cuba’s international medical collaboration, our Comandante en Jefe Fidel Castro Ruz. “We have organized a program of activities which will be take place in all medical brigades, above all in Algeria, where a ceremony will also be held,” stated Angulo Pardo. She also congratulated all those who have participated on medical missions; those who, motivated by revolutionary will and convictions have braved danger, and left their families behind to save the lives of children, elderly people, women, and entire communities throughout the world. 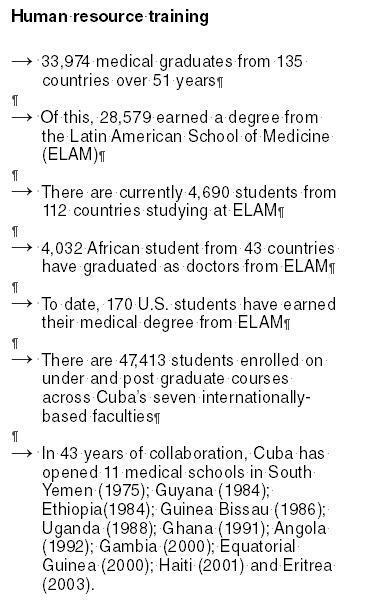 Cuba has been offering a range of cooperation modalities for many years now, including its Comprehensive Health Program; compensated technical assistance initiative; Operation Miracle (eye treatments); Cuban Medical Services (health tourism); Special Health Mission in Venezuela; Psychosocial studies and clinical genetics research; and Medical training program. It is worth highlighting the work of the brigades which make up the Henry Reeve contingent, specialized in disaster situations and serious epidemics, created by Fidel Castro on September 19, 2005, to help victims of Hurricane Katrina, and which has served in over 20 counties. An exponent of the contingent’s internationalist work is Nurse Delmis Sánchez Castillo, head of department at the UCCM, who served in Mexico from September 29 through November 15, 2017, as part of the Henry Reeve contingent, there to help victims of the earthquake which hit the state of Oaxaca. She explained that when a government requests help from a Cuban medical brigade to treat victims of a disaster or epidemic, the island’s authorities select a group of professionals depending on the situation in the affected country, with reinforcements sent if necessary, for example in the case of an epidemiological crisis or natural disaster. The collaborators receive comprehensive training during which they are given information on all aspects of the mission as well as the necessary equipment. “Once we get there, we start by setting up the field hospital, which has four areas: one for clinical consultations, where doctors evaluate patients; the second is a hospitalization area where patients are admitted depending on their condition and given specialized treatment. The third area is for surgical procedures and the fourth for laboratory diagnoses,” stated the UCCM department chief. The operating theater comes complete with all the necessary and most vital equipment to carry out surgical procedures including an electrode machine, heart monitor, mechanical ventilator, drainage equipment, intubation devices, as well as surgical lamps and tools to perform genetic, orthotropic, abdominal, ear, nose and throat procedures as well as other general operations. Meanwhile, there is also a sanitation area for staff to change their uniforms and to sterilize and clean instruments and materials. The space dedicated to laboratory analyses also features modern equipment to conduct clinical and bacteriological tests, as well as imagining machines to confirm diagnoses, above all ultrasound and X-ray equipment. The brigade also includes a group of clinical engineers responsible for setting up and dismantling equipment, as well as managing the hospital’s power grid and water supplies. The hospital also includes a pharmacy with vital medicines to treat a range of conditions. Each brigade member is provided with a backpack containing vital emergency supplies and essentials for surviving in difficult conditions; including food and water for the first couple of days, after which they must source supplies from local governments. 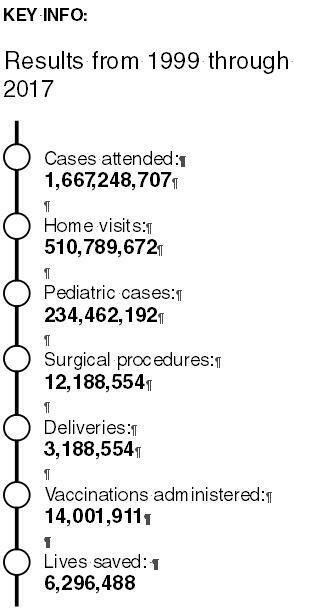 Delmis was shocked at the expense of medical treatment in the country, which largely explains why many Mexicans suffer from curable diseases. By the time the brigade left it had conducted 13,392 consultations and saved 196 lives, accomplishments for which it received two certificates of recognition from the Mexican parliament and Ministry of Health in the state of Oaxaca. Before serving in Mexico, Sánchez Castillo worked in Venezuela from 2007 through 2011 as an endoscopy nurse at a state-of-the-art facility, in the municipality of San Carlos, Zulia state, where she was frequently required to assume other tasks, such as assisting cardiology, anesthesiology, and intensive care doctors. According to the nurse, internationalist missions are hard for everyone, because it means being away from your family, work, and social environment. Collaborators must also deal with constant worry about their children and elderly parents in Cuba. However, Sánchez Castillo noted that all collaborators are supported by their colleagues back home, who take it upon themselves to look out for family members in their absence. “I have grown and reaffirmed the knowledge I gained at university during every one of these international missions,” stated Sánchez Castillo. Esta entrada fue publicada en Cuba, English, Política, Salud y etiquetada Cuba, Fidel Castro, Health, Healthcare, Internationalism, Medical cooperation, Solidarity. Guarda el enlace permanente.